Your Soul knows everything about you past, present and future. Is fear and confusion controlling your life and your decisions? Are you repeating the same patterns over and over again? Do you feel stuck and you can’t get out of your own way? A prayer is a thought and request sent with the intention and desire for divine intervention to occur. The divine awaits this thought of prayer with loving support and immediately energy is put into motion. This assistance could be healing, divine guidance, protection, opportunities delivered, a miraculous meeting or it could be as simple, yet profound as a divine hug. Prayers are not quantified so there is no prayer too big, too small nor do they count how many prayers you request. There are no angels behind the scenes saying Karen already asked for too many prayers for herself or others today so we can only take care of this many. The most important thing is to ask! Ask all day, all night, in the car, in the shower, when you are happy and life is good, when you are desperate and confused. Imagine this for a moment, the ocean and its vastness. Now use this image and imagine this same immensity of your spiritual team all around you: angels, divine helpers and loved ones in spirit, present in unconditional love for as far as you could see waiting for you to notice and ask for their loving support. Close your eyes and take a deep breath and just let go. Imagine the immensity of your spiritual team all around you: angels, divine helpers and loved ones in spirit, present in unconditional love surrounding you in support, guidance and protection. Then ask them to guide you to the perfect prayer that will help you answer your question or that it will provide you with what you need to know in this moment. When you are ready, open your eyes and move the cursor around the angel until you intuitively feel compelled to stop. 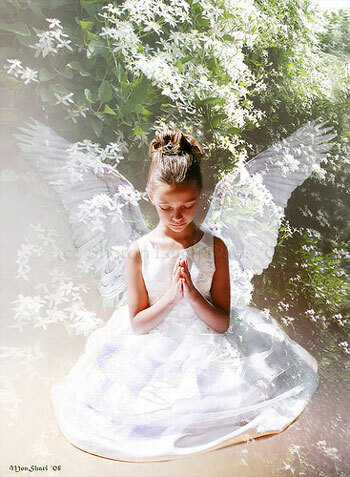 Then click on the angel and receive your Angel Prayer that will help you manifest your highest and best, better than you could ever imagine. Sit with your prayer in meditation and call upon divine guidance for help and support. Always pay attention to all messages, signs, synchronicities and coincidences that occur and if needed take action accordingly. Would you like a “Personal Prayer” written for you?